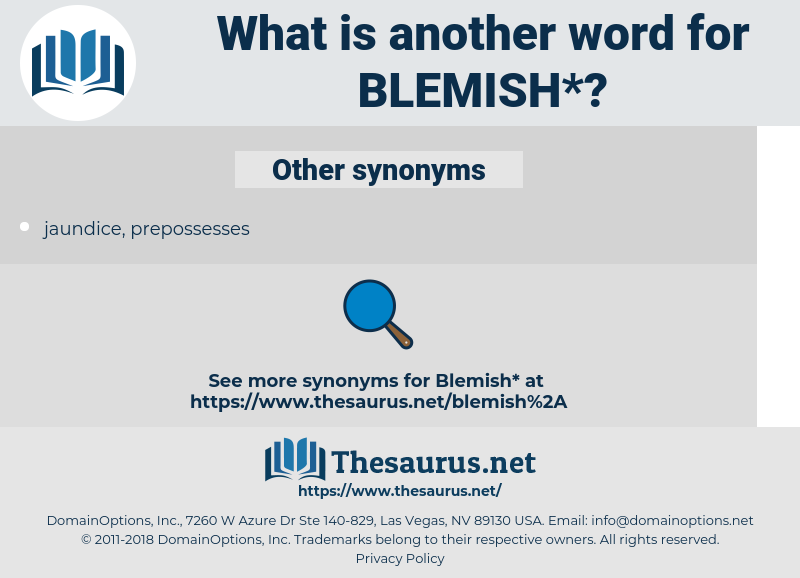 What is another word for blemish? stain, blob, soiling, taint, smear, flaw. beauty, cleanliness, honor, embellishment, ornament, decoration, clarity, advantage, strength, blank, benefit, esteem, perfection, adornment. assist, clean, perfect, straighten, mend, cure, fix, help, decorate, embellish, improve, heal, adorn, beautify, repair, aid.
" A lovely boy, without spot or blemish," said Keziah, three times over. True, France has had a lot of things done to her, ' you'd say, 'and she may show a blemish here and there; but still, don't try it unless you wish to start something with a now friendly ally - even if it is in your own house. 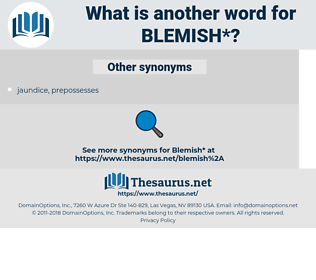 gouge, nevus, scrape, scar, stigma, birthmark, smirch, chip, verruca, scratch, check, milium, slur, smudge, mole, spot, whitehead, smear, chatter mark, crack, blot, burn, comedo, burn mark, blackhead, wart, nick, daub, dent, mark, ding. mangle, maul, mark, scar, pit, pock. soil, begrime, vitiate, impair, mar, bemire, dirty, deflower, colly, spoil, grime.